Offering a different approach to other textbooks in the area, this book is a comprehensive introduction to the subject divided in three broad parts. The first part deals with building physical models, the second part with developing empirical models and the final part discusses developing process control solutions. Theory is discussed where needed to ensure students have a full understanding of key techniques that are used to solve a modeling problem. Includes worked out examples of processes where the theory learned early on in the text can be applied. This book is structured and aimed at upper level undergraduate students within chemical engineering and other engineering disciplines looking for a comprehensive introduction to the subject. 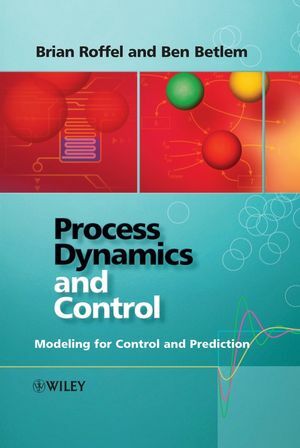 It is also of use to practitioners of process control where the integrated approach of physical and empirical modeling is particularly valuable. sProfessor Roffel has been teaching researching and managing research in the areas of analysis, simulation, control and optimization of process for over twenty years. In addition twelve years spent working in the chemical process industry gives his theoretical knowledge a practical grounding. Professor Roffel is part of a consortium of eight European Universities working on nonlinear multivariable control. He has also been involved in the practical implementation of advanced control in the chemical industry, in particular multivariable control and optimization. Dr.Ben H. L. Betlem, University of Twente, The Netherlands. 1 Introduction to Process Modelling. 3 Extended Analysis of Modelling for Process Operation. 4 Design for Process Modelling and Behavioural Models. 6 Linearization of Model Equations. 11 Analysis of a Mixing Process. 12 Dynamics of Chemical Stirred Tank Reactors. 13 Dynamic Analysis of Tubular Reactors. 14 Dynamic Analysis of Heat Exchangers. 15 Dynamics of Evaporators and Separators. 16 Dynamic Modelling of Distillation Columns. 18 Physiological Modeling: Glucose-Insulin Dynamics and Cardiovascular Modelling. 19 Introduction to Black Box Modelling. 20 Basics of Linear Algebra. 25 Discrete Linear and Non-linear State Space Modelling. 31 Introduction to Process Control and Instrumentation. 32 Behaviour of Controlled Processes. 33 Design of Control Schemes. 34 Control of Distillation Columns. 35 Control of a Fluid Catalytic Cracker. Appendix A. Modelling an Extraction Process. A2: Dynamic Process Model Development. A3 Dynamic Process Model Analysis. Please contact Wiley directly (emma.strickland@wiley.com) for details of the above software relating to this text.